Luci is Romanian, and I am Australian, but we are more alike than we are different. It's not where you live or what is on your shelves that makes you a Montessori parent, it's what is in your heart. It's the deep love and respect for the child. Today I am sharing with you a special Montessori family from Romania. Can you introduce yourself, your family and a little about where you live? Well, I am Luci from Bucharest, Romania where I live along with my family. I have two wonderful children, a girl aged almost 9 years old and a boy aged 15 months old. Bucharest is a fascinated and intriguing city, where the old meets the new in a sometimes, not so soft encounter. It develops very fast, so the life is fast for us too. We live in a small apartment by a park with a beautiful view to a lake. I am fascinated by Montessori philosophy and the Montessori story began for me after the birth of my daughter, Sofia in 2009. I started reading and learning about it, and, by the time she was 3 years old, I was already a student in a Montessori course, leaving behind my old life. 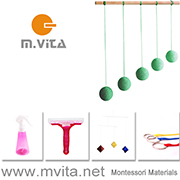 Now I work as a Montessori teacher for the toddler classroom (1 to 3 age group) in a beautiful Montessori kindergarten in my home town, Bucharest. I was AMI trained for the 0 to 3 age group (Assistant to Infancy) at the Montessori Institute of Prague and I also choose to train as a teacher assistant for the elementary (6 to 12) at the Montessori Institute of Bucharest when Sofia was 6 years old. I also do parent information events and workshops, and I help them prepare and learn about the first years of their children. What does Montessori look like in your city? When I started reading about Montessori, 8-9 years ago, Montessori kindergarten was a rare species in Bucharest. But there was also a will and desire to make things better, so the schools started to appear. Now, there is no public Montessori education, only private and unfortunately, still very expensive for the majority of people. But there are options and parents get to choose what to do. For example, you can go to a seminar about Montessori education in the first years, you can choose a kindergarten with a part time or full time program for your child, you can read some books or you can take a course at the Montessori Institute of Bucharest so you can know what to expect and what to provide for your child. What I wish is to bring this education closer to people that understand its value, but have no possibilities to enroll their child in a Montessori kindergarten. 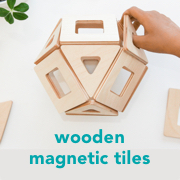 What does Montessori look like in your home? When my daughter was born, I was neither trained, nor did I know anything about Montessori. I started to teach myself, to read and learn, watch my daughter and follow her interests in order to prepare her room and activities (for sure I did the best I could, but it was far from what I know now). Later, when she was 3 years old, she went to a Montessori kindergarten. Then, she went to a Montessori school for her lower elementary (6 to 9). This year, she started a traditional school and she seems excited about this school, very curious to learn new things. What I want to say is, even though I did not have all the knowledge at her birth, and I was just following my intuition, she turned out to be just the way I dreamed her to be, because this is what they do, they follow the heart. and a beautiful low shelf with toys and materials. When we started baby led weaning, I made a lovely set up in the kitchen for him, to help him become more and more independent, with just a few activities. I was always flexible and always changing his environment when he needed more (in this way is also more affordable). Of course you get stuck from time to time with one activity or you just don’t understand what he really needs, but I kept waiting for him to show me. Now, we have more child friendly areas around the house: in the bathroom, at the entry hall or the living room, even in his sister's new room we have a playing area with a beautiful view by the lake. What is your greatest or most current parenting struggle and how are you dealing with it? I work very hard with myself for I have not been raised in this beautiful and peaceful manner. My major struggle is this need to control everything. Unfortunately, I did not see this for a long period of my life and I lost beautiful relationships because of fear of not losing them and trying to control them and my life– what a paradox! As a parent, this need to control my life made me to look "perfect” in my daughter’s eyes – but my false image acted as a boomerang. Because now she wants to do perfect things, to look perfect, to have a perfect handwriting just like "mummy”, and guess what? She often fails like any one of us and her disappointment is huge. What I do is to show her and reassure her that I am just a human being, and it is ok now for me to fail, or make mistakes. Because these are lessons to learn from and opportunities to create beautiful things later. What are on your children’s shelves right now, what are their current interests? For my baby boy, it is very easy to translate his current need. He likes water a lot, which is perfectly normal. So he spends a lot of time in the kitchen, in the practical area. He likes to cook (cutting cucumbers or cheese, peeling banana etc. ), but also he is moping a lot, or washing his hands at the sink, watering flowers or arranging them in vases (more like pouring water everywhere). Why I give all of these at home? Because he is doing purpose work. He is building up new abilities, developing his senses, building up collaboration, coordination, strategy and structure in thinking, he becomes more confident and self aware of his power in the environment. He can change his environment. He enjoys the result with all of his senses and the result is logic and useful for him. He enjoys his freedom in a very clear, specific and secure context. He is becoming independent – in a word. In his room, I introduced lately a lot of music and new art activities – such a great way to communicate with us his joy or tiredness or curiosity. But, of course, the eye-hand coordination materials like building blocks, puzzles, "infilare" or "imbucare" materials are there on his shelf. What I try to do is observe his interest and then try something to see if it works. If not, I just readapt or remove and come back later with it, in a few days or weeks. Not now (I just finished Yalom's book "Becoming Myself” hahaha see the answer for the kids reading part ☺ funny, no? ), but I really enjoyed some time ago "The Explosive Child” by Green Ross and "The Aware Baby” By Aletha Solter. Also, from time to time, I go to "Your Child's Growing Mind” by Jane M Healy, very good read if you are passionate about neurodevelopment. What are your children reading right now? Sofia enjoys now all the books about becoming someone, about understanding how it works, so she reads books like "Goodnight Stories for Rebel Girls” or "Harry Potter”– the curious thing is that in her Montessori school, all of her colleagues knew the "Goodnight Stories" by heart, but in this new school, they didn’t even heard of it. Pavel likes a lot the book series about seasons – the author is Susanne Berner. Do your children like to cook or bake? Do you have a favourite recipe you could share? We do love pancakes with wild berries. Sofia can make them anytime – they are so, so easy to make. You can use one egg, one banana and 2, 3 spoon with oat flour. Just mix everything well. If it is too watery, you can add more flour. In a non-stick pan, add a little bit of bio butter and let it warm on the gas stove. Then add the composition with a spoon. Cook it on both sides. There will be 3-4 pancakes. I serve them hot with a little bit of honey and wild berries (fresh or from the freezer). They are very tasteful and a great opportunity for a baby to practice his pincer (finger grip) abilities. Thank you so much to Luci for sharing her beautiful family and her home with us. I feel so fortunate to have found Luci and to be able to be inspired by her teaching and parenting. I am taking on board all of her book suggestions. If you have a toddler or an interest in Montessori toddlers you might like to follow Luci here on Instagram or Facebook. Luci often shares photographs and videos from Pavel and his classroom which are wonderful!